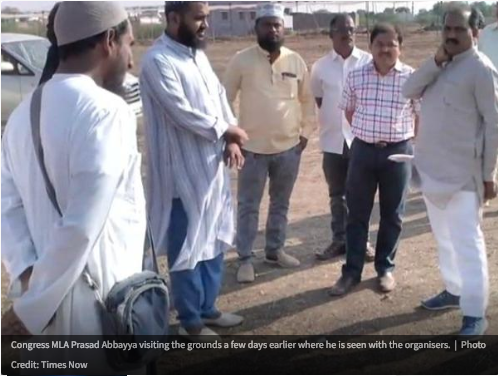 An Islamic religious congregation or ‘ijtema’ being planned in Hubli, Karnatana this coming weekend by the terror-linked Pakistan-based Dawat-e-Islami group which proselytizes Barelvi Sunni Islam has found a willing ally in Congress MLA Prasad Abbayya, news channel Times Now has revealed. In December, Dawat-e-Islami was prevented from holding a similar ijtema in Telangana after several local Muslim groups & BJP MLA Raja Singh had protested because of the group’s terror links. The Muslim groups in Telangana had said that Dawat-e-Islami holds views which are against the beliefs of majority Muslims in Hyderabad and India, and that any meeting would disturb peace and create a wedge between Sunnis and Shias. It is reported that local Muslim groups in Hubli have also opposed the planned ijtema, but Dawat-e-Islami claims that they have received permission to go on with the event. Karnataka Home Minister and senior Congress leader MB Patil declined to comment on the matter and said that it has not come to his notice and that he was not aware of the event. However, visuals beamed by Times Now show Congress MLA Prasad Abbayya visiting the event ground a few days earlier where he was seen with the organisers, clearly indicating that he had given his backing for the event. Abbayya is the same MLA who had stirred controversy during the Karnataka assembly election campaign by seeking help and votes from the radical Social Democratic Party of India (the political wing of terror-linked Islamist group Popular Front of India, i.e. PFI). Another Congress MLA Abhyachandra Jain, also an ex-minister in the previous Siddaramaiah-led Congress government, is known to be close to PFI, and had stitched together an alliance between Congress and PFI’s political wing, SDPI, for panchayat elections. Jain is the MLA from Moodabidri constituency, the same place where flower-vendor and Bajrang Dal activist Prashant Poojary was hacked to death by 9 PFI workers. 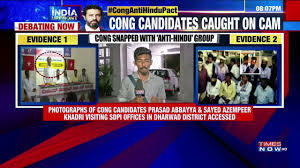 As per Times Now sources in the Hubli-Dharwad commissionerate, Dawat-e-Islami has the required permission for the event and that they have the backing of the local Congress MLA. Dawat-e-Islami (DI) is an Islamic organization based in Pakistan, which was founded in the early 1980s in Karachi by Muhammad Ilyas Qadri, a perfume-selling merchant from the ethnic Gujarati community. Literally translated as Invitation to Islam, the organization draws its ideological views from the teachings of the eighteenth century Sunni reformer, Ahmad Raza Khan (1856 – 1921) from the north Indian town of Bareilly, in Uttar Pradesh. Ahmad Raza Khan headed a powerful religious movement known as Ahle Sunnat wal Jamat, popularly referred to as Barelvi in South Asia. Dawat-e-Islami became the main proponent of Barelvi ideology — following the Sunnah (traditions of the Prophet of Islam), recitation of devotional poetry such as naat, and expressing deep reverence for sufi saints. The organization encountered opposition from several literalist traditions, particularly from another famous north Indian school, Madrassah Deoband. Tablighi Jamat (TJ), a Pakistani-origin world-wide proselytizing organization representing Deobandi teachings strictly prohibits deference to anyone other than Allah, thus vehemently disagreeing with DI’s reverence for Sufism. Most Pakistani terrorist outfits including the Taliban, Lashkar-e-Jhangvi (LeJ) and Ahle Sunnat Wal Jamat (ASWJ) associate themselves with the Deobandi faction of Sunni Islam. But the Barelvis, often mistaken for being “moderate Sufis” in Western & Indian liberal circles, are fast becoming the new face of Islamic extremism in Pakistan. DI and associated Barelvi groups it has spawned like the militant Sunni Tehreek (ST) have a pathologic obsession with ‘blasphemy’ and hold bitter hostility against members of the country’s Ahmadi Muslim sect. Mumtaz Qadri, the cold-blooded murderer of former Punjab Governor Salman Taseer who was accused of committing blasphemy when he criticized the abuse of the country’s anti-blasphemy laws, is the poster boy for the extremist Barelvi cause. Qadri was epitomized by Barelvi clerics both within and outside of Pakistan and hailed a ‘saint of Islam.’ His death sentence last year was followed by mass riots in the country’s capital, Islamabad. Shockingly, Mumtaz Qadri was one of elite police guards in Governor Taseer’s security detail, and was believed to be a follower of Dawat-e-Islami. Following this murder, even military authorities in Pakistan decided to curtail the proselytising activities of DI in their ranks after reports by intelligence agencies warned that its growing influence in the armed forces will have serious implications. DI is mostly concentrated in Karachi and receives its financial support from wealthy Gujarati merchants. many of whom belong to the Memon ethnic group. It offers online courses in Islamic studies and runs a television station, Madani Channel – but strictly prohibits any footage of women or female members seen in public, even if their faces are veiled. How Pakistan-based radical organizations like DI and Tablighi Jamaat even manage to have a presence in India is a question that none of our brave-heart Lutyens’ journalists dare to ask. Forget questioning the Nehru-Gandhi family on their party’s brazen support to such Islamist groups.